​​​​​ KATY – Retail leasing rates are steadily rising, and commercial realty groups say several factors—such as income level, demographics and daytime traffic counts—justify the higher rents. Retail leasing rates can range from $1.65 per sf at Clay Rd. Shopping Center at 19214 Clay Rd., to $35 per sf at LaCenterra at Cinco Ranch as of March 2017, according to LoopNet.com. 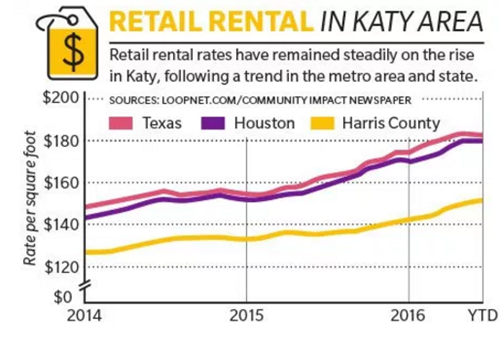 Katy currently operates in a landlord’s market, which means space is in demand with more than 93 percent occupancy in Katy’s Class A—top tier, newly constructed—buildings, according to Jazz Hamilton, first vice president with the retail brokerage services group at CBRE.